There are many wonderful sacred places in Moscow, one of which is the Savior-Andronikov Monastery, where St. Andrei Rublev is buried, and where the Andrei Rublev Museum of Icons is located. The monastery's Savior Cathedral (photo to the right) is the oldest surviving masonry church in Moscow, and was about the first to convert wooden architectural forms into masonry. For information about St. Andrei, plus icons and photos of the Andronikov Monastery, see our Saints' Lives Article, The Life of St. Andrei Rublev. 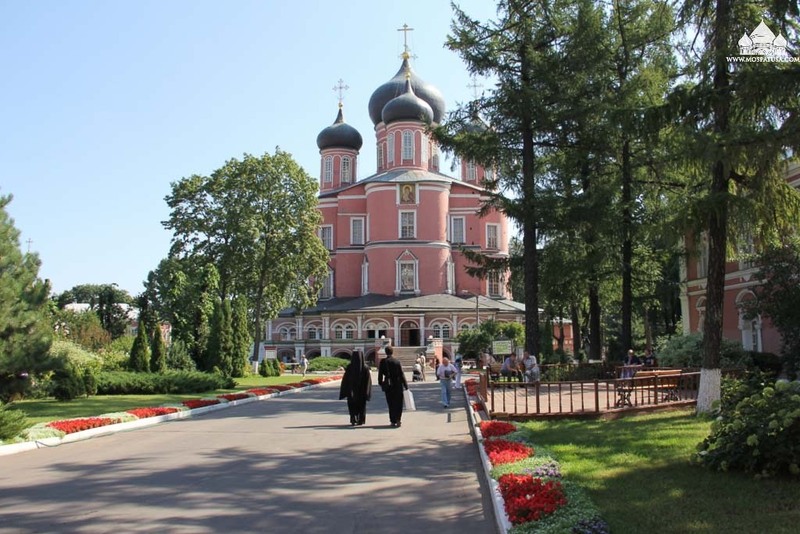 Another sacred place of pilgrimage in Moscow is the Men's Monastery of the Don Icon of the Mother of God (Donskoi Monastery) (photos, above left & center), where St. Tikhon, who had been the Bishop of North America before becoming Patriarch of Moscow, was secretly buried in 1925. 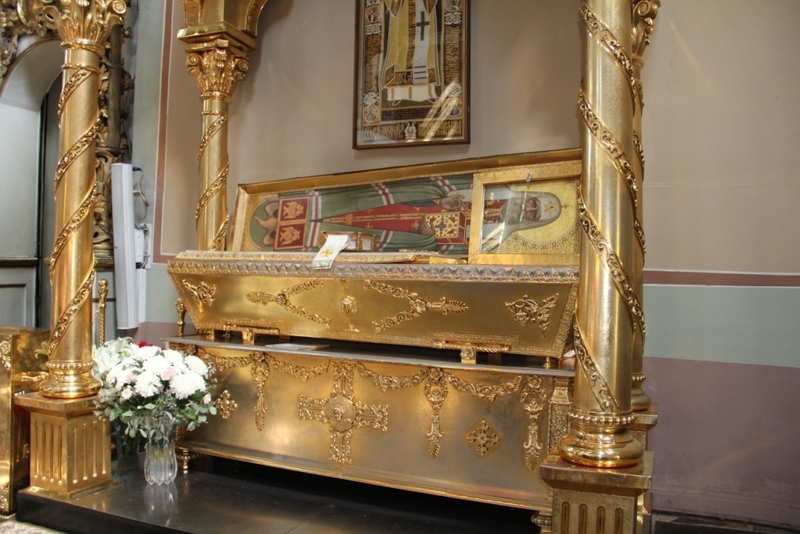 After the Donskoi Monastery was reopened, St. Tikhon's relics were placed in a fine reliquary and transferred to the main church, where they are located on the left, in front of the iconostasis (photo, above right). For information about St. Tikhon's life, plus icons and photos, see our Saints' Lives Article, The Life of St. Tikhon. 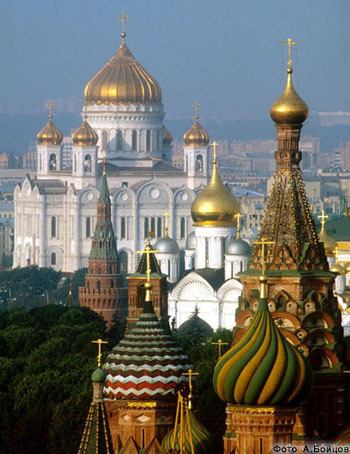 One of the important sacred sites in Moscow is the Christ the Savior Cathedral (photo to the left and at the top), located not far from the Kremlin in central Moscow, along the Moskva River. Originally built to commemorate Russia's defeat of Napoleon in 1812, it was regarded as THE church of the Russian people, and was constructed using donations from ordinary people throughout Russia and the world. It was finally completed and consecrated in 1883. Less than 50 years later, it was blown up by Stalin in 1931. But his efforts to build a giant monument to Communism failed, and, finally they ended up building the giant Moscow swimming pool (frequently used for Baptisms), which stood until the fall of Communism in August 1990, and the election of Patriarch Aleksey. 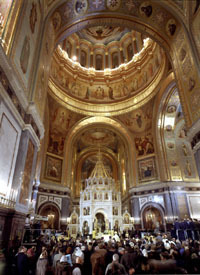 One of the great legacies of Patriarch Aleksey, of blessed memory, was his vision of rebuilding Christ the Savior Cathedral, mostly as a replica of the original design (photo, above left). 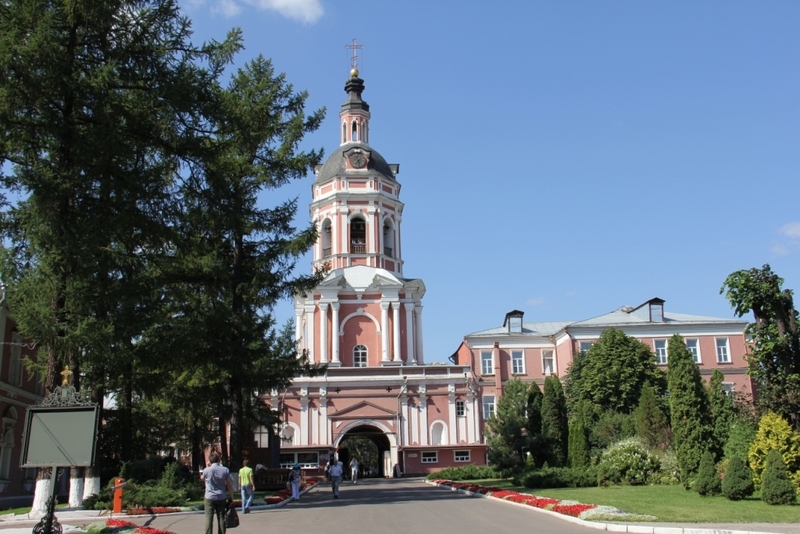 As the largest church in Russia, it took a number of years, but it was finally completed. As Stalin sought to destroy the symbol of the Russian people's Orthodox Faith by blowing up Christ the Savior Cathedral, so, in reconstructing it, it has become a symbol of the resurrection of the Russian people's Orthodox Faith. In 1996 (when the author visited it) the complete exterior and the downstairs church, as well as the very pleasant and justifiably popular park-like grounds that surround the enormous building were finished. In 1996, the magnificent lower Church of the Transfiguration was completed and consecrated on its Patronal Feast Day, and was serving as a regularly functioning church, while work on the interior frescoes, iconostasis, and other decorative work was being done in the main upstairs church. 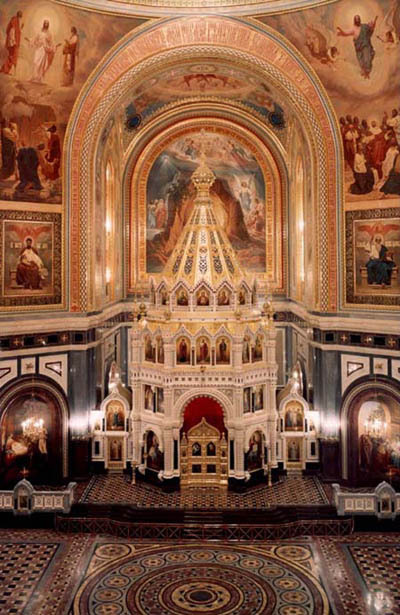 The lower church was done in traditional iconographic and decorative style, while the main upper church is in the 19th century style (photo, above center). In the lower church, the iconostasis is totally gorgeous (photo, above right), as are the mosaic icons that cover the columns, portraying Metropolitans of Moscow who have been glorified as saints, including two of our American saints, St. Innocent of Alaska and Patriarch St. Tikhon. In the summer of 1996, an incredible forty-voice choir was singing Sunday Divine Liturgy, not in a distant choir loft, but right next to the faithful standing in the central nave — a very awesome experience, indeed! 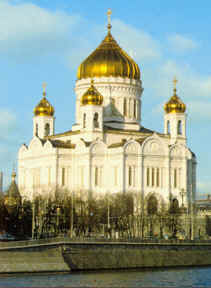 The new millenium was greeted in Moscow with the official opening of the upper church on December 31, 1999. Now that the main upper church has long been completed, of course the Patriarchal Choir sings at the Divine Services upstairs. 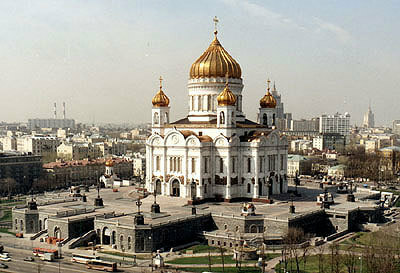 If you will be in Moscow on a Sunday, you won't regret attending Divine Liturgy at Christ the Savior Cathedral. Numerous wonderful DVD recordings have been made and sold of major feast days and other special events, with the Patriarch presiding, beginning with the complete Great Consecration of the upper church on August 19th, 2000. Even when there are no services going on, a constant flow of people come here to light candles and to pray. 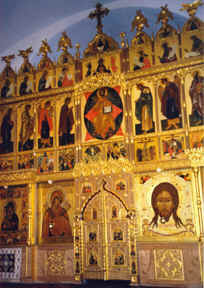 There also is a remarkable exhibition hall that encircles the downstairs church, containing a beautiful collection of contemporary and some historical liturgical arts, some folk arts and children's art, various changing exhibits, plus some historical exhibits about the history of the first Christ the Savior Cathedral and its recent reconstruction.